What is Poria Mushroom Extract? Poria, Wolfiporia extensa (Poria cocos), is a fungus in the family Polyporaceae. It is a wood-decay fungus but has a terrestrial growth habit. It is notable in the development of a large, long-lasting underground sclerotium that resembles a small coconut. 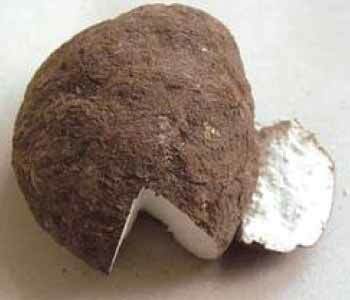 The sclerotium of Poria cocos has been used in China for thousands of years. Wolfiporia extensa is a source of a triterpenoid compound, pachymic acid, which has been the object of scientific study based upon the mushroom's role in traditional Chinese usage. Pachymic acid has shown promise in support healthy cellular function. As a dietary supplement, take 1000mg of Poria Mushroom Extract once daily. To learn more, read the Poria mushroom reviews and experiences below. Where to Buy Poria Mushroom Extract? Nootropics Depot offers 30g or 60g jars of certified organic Poria Whole Fruiting Body Mushroom Extract. Nootropics Depot's Poria mushroom extract powder has been lab-tested and verified for both product purity and identity. You May also like Poria Mushroom capsules. High beta glucan content. Great Shen tonic, that goes great with other Shen tonics like reishi and polygala. Great for getting a restful sleep. Amazing for the immune system. Poria powder is much easier to cap than the fluffier mushroom extracts.